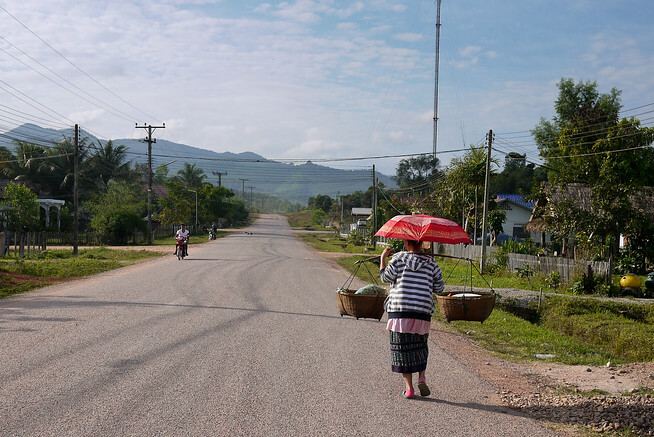 Returning to Laos was an education on how tourism can affect a country; the difference a mere three years has made in Laos at times seemed inconsequential—unpaved roads were still riddled with jolting, bone-shaking potholes, and a slow and syllabic “sabaidee” hello generously rang into the warm afternoon air from sweetly grinning locals standing in their shop doorways. Then, the same as now, the (often excited) ring of falang, or rather westerner, dipped and flowed into conversation as I walked through the small towns with my niece, Ana. Monks all over Asia generally learn English as soon as they enter the monkhood, and throughout my time in SEA, I seek out monks in new cities because they are always eager and willing to share information, stories, and cultural history. 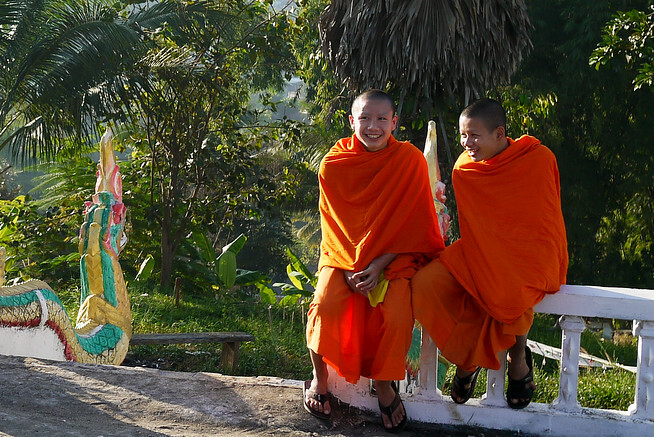 At sunrise, these monks were no exception in Houay Xai, Laos–great English and eager smiles! It’s worth noting that I threw my toilet paper in the toilet…yes, right inside the toilet bowl instead of a trash can nearby. Okay, not everywhere. In fact, not even most places, but there are places with fully flushing toilets in Luang Prabang and that, my friends, is a gigantic flying leap different from the dank and dark squat toilets (and I considered those good toilets!) of just three years past. The Slow Boat back in 2009, complete with rickety wooden benches! In short, the tourism path is cleaner, neater, better organized, more comfortable, more expensive, and just more than it was three years ago. And thankfully, it’s also not less Laos than I remember–throughout these new developments, the people and sentiments felt largely the same, and the political maneuvering with the rural ethic minorities is still a sad and ongoing game. Cushy bus seats take the place of the wooden pews of the past on the crowded boat down the Mekong River in Laos. The UNESCO protections in place in Luang Prabang safeguarded the city from any sort of modern face-lift over the past few years, a protection not in place in Laos’ capital city,Vientiane, where tall cinder-block hotels and offices line the streets in a disjointed jumble and cavernous holes gap in the skyline in a wave of new, and often unfinished, construction. The country has changed; and I have changed too, to be sure. Over the past few years, I often listed Laos as one of the highlights from my round the world travels. Going back this time, I realized there was more at work during that trip, and it’s this “other” that likely played a part in why I enjoyed traveling the country so much. This time, I realized I cannot reconstruct the past, there is no way to recreate a moment from my past travels no matter how much I loved it in that moment. I backpacked Laos with Laura, a good friend from the years I lived in Los Angeles, and we did the more footloose and fancy-free activities. Back then, we struggled for an internet connection strong enough to support a quick and choppy Skype chat home, I got sicker than I have ever been in my life, and we spent days upon days on slow boats and buses as we crisscrossed the country. I returned with Ana last month, unsure of what I would find as took that same route down the Mekong River. Not too surprisingly, the road infrastructure is still in transition (meaning they rely on dirt roads outside of the tourist route) and there were still many weary, long travel days. But, I noticed that very same glitter stick struck some of the more popular guidebook towns. Wifi. Western restaurants. Packaged experiences playing to the interest in Southeast Asia’s ethnic minorities (and some not doing so very ethically, I might add). 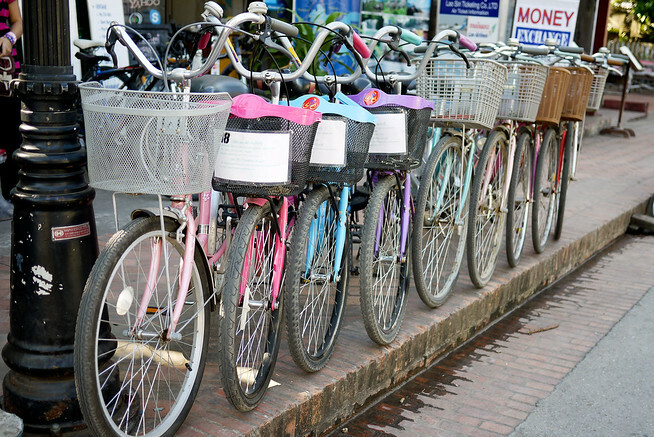 A colorful line of bicycles for rent on the streets in Luang Prabang, Laos. But then, I look to the positive side of tourism…and the fact that this is, after all, still Laos. There was more wealth spread throughout the large towns (hints of that are trickling down to the smaller towns). Large-scale tourism brings money, and when it’s done well (and I’m not entirely sure that’s the case in Laos), it can positively augment the way me, as a traveler, sees and experiences a place. There are many elements of tourism done well in Laos. 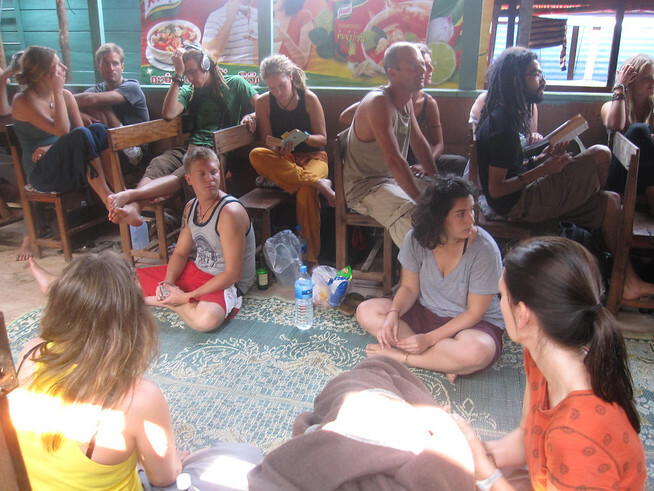 Luang Prabang had a range of grassroots and local projects. Ana and I took a full day weaving class from an organization supporting cultural preservation in Laos. We learned a traditional stenciling method the monks use to decorate new temples. Fair-trade shops abound. The food is delicious, plentiful, and safe to eat (more-so as Western sanitation standards make themselves known). With tourism comes more English, and that meant asking more questions from our guides and guesthouse owners so we could understand the nuances. And, the glitter stick version of Laos had its up side, because without it, I’m not sure Ana would have enjoyed the country nearly as much. Whereas I, as an adult, love sipping an afternoon coffee watching the boats drift down the Mekong River, she needed engagement on a different level, which we found in the various towns at the local level where just the mere hint of English being spoken meant we had enough charades and gesturing to still be fun but could get our point across. I’m still reflecting on my return to Laos (and plan some stories and photo-essays in the coming weeks), but my conclusion is: Laos has changed, but the essence of the country, and the warmth of the Laotians leave this country in a special place in my traveling heart. Thanks, Shannon, for a thoroughly enjoyable report. Be safe. I believe some this has to do with the experienced traveler vs inexperienced, or at least the traveler familiar with a culture and one not familiar with a culture. My wife, for example, spent time in India and felt like it was quite a bit different from the states. South Africa, on the other hand, struck her as vaguely similar. That said, our shrinking world is resulting in a level a familiarity unheard of before. That is both good and bad. Beautifully written. Laos will always stick in my mind as one of my favorite places, but I can see how tourism rapidly changes countries, for better and worse. I love how you referred to it as the “glitter stick version of Laos” :) Laos is by far one of my favorite countries due to the warm and engaging people… and it’s nice that it hasn’t changed. I had a discussion/debate once in Africa about how things have changed there and become more Westernized. Some people think it’s ‘sad’ when they see that people living in mud huts now live in mud huts with t.v. While, yes, sometimes I think there are better things we can do with money than buy a t.v., the very people who think it’s sad are probably also relaxing on a Friday evening by watching t.v. or a movie. Sometimes it’s hard to see how Western influences change a culture, but it’s bound to happen. And hey, no one can disagree about Western toilets being an improvement! 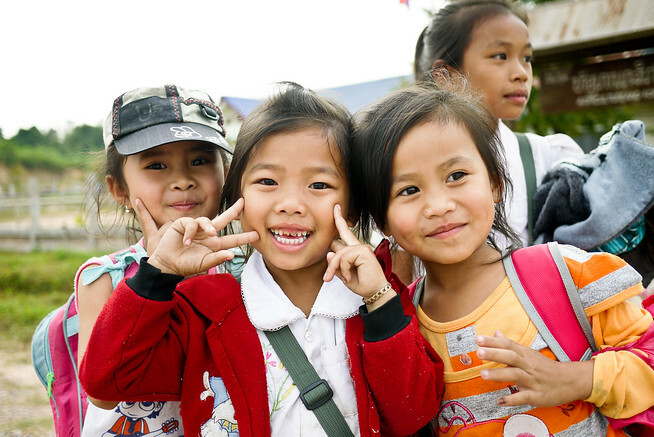 Can’t wait to read more posts and see more pictures from your return to Laos! This is true, but the modernization was paid for with your spending in 09 and publicity of blogs like this one. Personally, I don’t think its bad, its great for more people to get to experience new places. Laos always has some fantastic sights and sounds on offer! I understand what you mean. Last year when I visited India after 3 years I was suddenly hit by how much the country had changed. Suddenly there was so much westernization, and though the essence was there and the cities were as chaotic as ever, something had changed towards a more globalized world which is exciting but at the same time a little sad too. I’m looking forward to visiting Laos in a few weeks–everyone who has been has said it was their favorite spot in Southeast Asia, and the highlight of their trip. Chatted with so many people on Gili T who raved about it that it convinced me to shift around my plans–looking forward to three weeks there, particularly after reading this piece. Glad you had a lovely time–although isn’t it hard to go back to somewhere that we loved? Can never quite recreate the same experience–can only hope for a new and equally brilliant one! Enjoyed your take on Laos as we’re currently visiting for the first time. I agree about the double edged sword of tourism. It does change a place and sometimes the original idyllic environment and charm is lost. However, in many ways the changes that tourism brings (better infrastructure, more wealth, etc.) are really positive things for the locals and their standard of living. I’ve really enjoyed Laos and their ever friendly people. Here’s to hoping that as things change, they do for the better. Really interesting take on the upsides of tourism in that last paragraph – I never really considered how an increased presence (and interest) of visitors could lead to local projects, workshops & educational opportunities!! Do you think I’ve missed the “golden years” of Laos? Is it too late? I love Luang Prabang, sadly the only place I have been in Laos. The bicycles were not lined up for hire in April 2010. Love following your travels. I love that shot of the kids! I felt this way of Beijing!!! I couldn’t believe how much it had changed from 2003 to 2008! I was there about five years ago and at the time wondered what would happen when all the backpackers found it. Sounds like Laos has survived the influx pretty well, but it’s still always sad to see a country get overtaken by tourism.